Need tips and plans for growing lettuce in the spring or in hot weather? Good lettuce varieties including Icberg, Romaine, Bibb, Loose Leaf, and Butterhead in a small backyard, container, or raised vegetable garden. When planting lettuce in your home garden, there are a few things to remember. 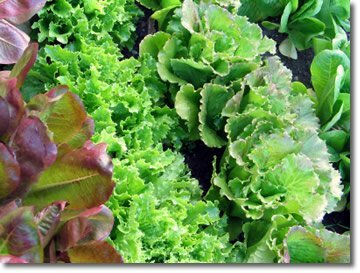 Lettuce is very easy to grow, and makes a great addition to any home vegetable garden plan. Lettuce grows well in container gardens, raised bed gardens, and also in backyard row gardens. These ABC’s of lettuce cultivation will help you harvest these great leafy vegetables, which are rich in nutrients, in great abundance. Include Your Favorite Lettuce Varieties in Your Vegetable Garden Plans! Also, mixed lettuce seed packets are available at your local garden center, so that you can plant all the varieties together in one row! As lettuce grows and matures quickly, you can plant all lettuce types every three weeks to ensure a steady supply to your kitchen throughout the growing season. Lettuce is used nearly every day by most families for salads and in sandwiches. It is easily grown in the ground or in container gardens. The varieties of lettuce allow for flavor, crunchiness, high nutritional content and aesthetic value unequaled by other green leafy vegetables. And by growing your own lettuce, you will save on your grocery bill as well! 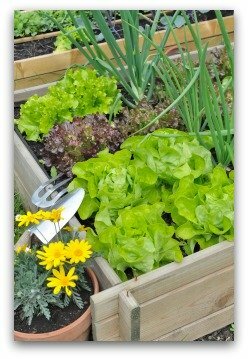 Growing Lettuce in Raised Beds is Easy! 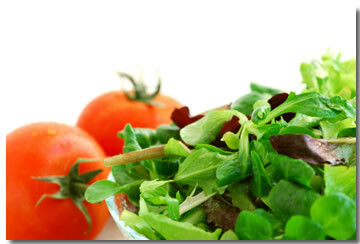 To ensure good results when planting lettuce, you will want to purchase fresh seeds each season. Store the opened seed packet inside a sealed container and keep it in the refrigerator. Plant a few more lettuce seeds every 2-3 weeks to keep a steady supply of lettuce throughout the growing season. On the other hand, crisphead seedlings need to be about 10-12 inches apart. When thinning lettuce, wait until the leaves are the size of "baby" lettuce, and then you can eat the plants you have thinned! For thinning recommendations when planting mixed varieties of lettuce, follow the instructions on the back of the seed packet. When preparing the beds for planting lettuce from seeds, leave enough room to plant your rows of lettuce 12-18" apart. You need to ensure that the soil is light, moist, sandy and rich in humus to properly cultivate lettuce. Have a source of water located near your planting area. Water your lettuce plants frequently, especially when the seedling are small and have shallow roots. Lettuce will grow well in containers or in the ground. It is a great plant for beginning gardeners, as it grows quickly and is very easy to care for. Most varieties of lettuce also grow well in light shade, and especially need shade during the heat of mid-summer. Lettuce varieties thrive in cool weather, which is usually late spring, early summer, and early fall. If you do plant lettuce in summer, you may end up with bitter lettuce leaves, unless you provide adequate water and some shade during the hottest time of the day. 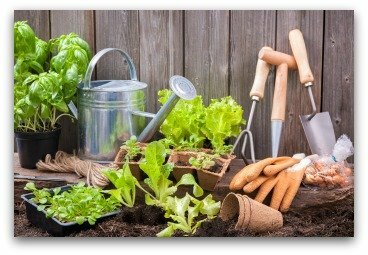 There is no need to fertilize your lettuce plants if you have used a good potting soil, or added compost or humus to your ground soil. Lettuce plants like cool weather, but they do not like freezing weather. 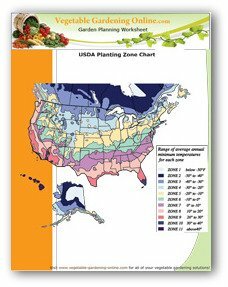 Use our zone chart and planting guide to determine the outdoor planting time in your zone. Lettuce plants will grow well in partial shade. When the weather is hot, provide some shade for your lettuce plants. Watch them closely, and harvest promptly as they will try to "bolt" and form seed-heads quickly during hot weather. You must cover the planted seeds very lightly with soil. Don’t pack it too tightly as some lettuce types need light to germinate properly. You can, however, opt to dig a hole about ¼-½ inch deep before covering the seeds. When planting lettuce indoors in pots, especially for lettuce of the bunching varieties, remember to provide the seedlings with plenty of direct sunlight. However, don't let the soil get dry. 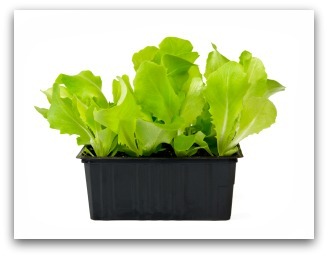 Lettuce plants grow better in cool weather, so plan on having a cool place for your growing lettuce plants. If you do not have a sunny location indoors for your lettuce plants, provide them with a grow light. In conclusion, your success as a lettuce grower depends on proper planting, caring and harvesting of your lettuce plants. 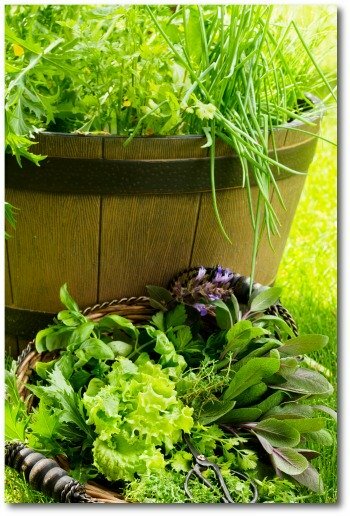 Growing lettuce is one of the easiest and most satisfying garden vegetables you can grow. Don't wait to try it yourself!